If you are familiar with digital marketing, you have probably heard the phrase “evergreen content”. However, you would be surprised at how few people actually know what it is. Put simply, evergreen content is content that is created with the goal of long-term relevance. It is called evergreen because of evergreen trees, which do not lose their leaves when the seasons change like other trees. Evergreen trees have become known as a symbol for perpetual life. Now imagine perpetual content and you can imagine that the benefits would be immense for your business. Now that we have a basic understanding of what evergreen content is, let’s discuss some of the benefits. The first benefit is that evergreen content has a long “shelf life.” Unlike breaking news, evergreen content is written about topics that change very little over time, such as “How to Tie Your Shoe” or “How to Build a Treehouse.” As a marketer, evergreen content is your best friend because it can be shared consistently as time goes on, which lessens the amount of content you have to continually produce in the future. Another major benefit we will discuss is the role evergreen content plays for beginner level readers that are consuming your content. The best evergreen posts are geared towards beginners and discuss very basic topics. The reason for this is simple, the fundamentals are less likely to change over time. Imagine your business sells bicycles. If you write a piece of content about “How to Put Your Chain Back on Your Bike,” it will almost certainly be relevant 5 and even 10 years from now. Now consider who would be looking for this type of content. Chances are it will be beginners, not experienced bicycle riders. The beauty of evergreen content is that it informs potential customers and in the process builds trust. When these beginners decide it is time to buy a bike, chances are they will think about your business and how much you helped them learn about the basics. Quality Backlinks: One way Google deems a website as “trusted” is to analyze what other websites are linking to its content. If Forbes, for example, included a link to one of our blog posts to support something they wrote about, then Google would begin ranking our site higher. 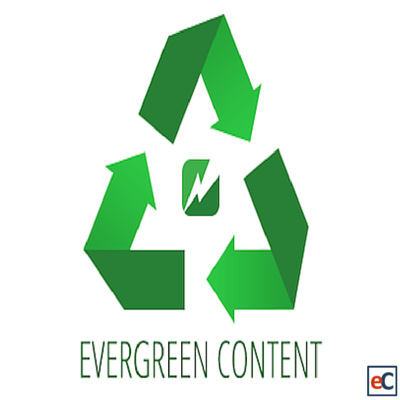 Evergreen content attracts a lot of backlinks because it typically covers basic topics in a lot of detail and it will remain relevant long after the piece of content linking to it is posted. Links to Other Content on Website: Google’s algorithm also likes when websites link together different pages. Again, evergreen content is a perfect candidate for this. Link together related pieces of content to make it easier for visitors to seamlessly travel from one piece of content to the next. So we have discussed what evergreen content is, why it is beneficial for your business and potential types of content you could create. Now comes the important part, how do you write evergreen content? The first thing you want to do is approach your ideas from the standpoint of a beginner, as this will be the primary consumer of evergreen content. Think back to when you were a beginner and make a list of all the topics/skills you had to learn about to get to where you are now. Once you have a solid list, try to make them even more specific. For example, “How to Build a Treehouse” could be broken down into: “How to Find the Right Wood for a Treehouse,” “Which Tools Do You Need To Build A Treehouse” and so on. The more focused you can get your topics the better. This will allow you to produce more content, but will also make it easy for someone to find exactly what they are looking for. Avoid time sensitive phrases like: recently, yesterday, etc. To get the most out of your evergreen content, you must do more than just write it. Though the writing aspect is important, there are a couple of other important things to consider. One strategy is to include links in your content to past pieces of evergreen content you wrote. First off, doing this will strengthen the piece of content you are writing by providing additional resources for your readers. The second benefit is that you will drive traffic to your older posts. Since long term traffic is the goal of evergreen content, this will help to ensure readers continue to discover and read your content long after you publish it. You will also want to periodically update your old evergreen posts. Even the best writer can’t predict the future 100% of the time. By skimming through old content and updating them, you will ensure it stay relevant for readers. The few hours a couple times a year that you spend updating minor details will allow your content to remain relevant, encourage readers to share and continually grow your business by regularly driving new traffic. Even the best piece of evergreen content needs occasional revisions, so do not forget to check for relevance occasionally. Earlier we spoke about the role evergreen content plays for beginners. As a writer, you should make it as easy as possible for beginners to consume your content. Even better, you want to make it easy for them to consume all relevant content you have wrote. An easy way to do this is to have a special section for beginner content. Many blogs for example have a ‘Getting Started’ section that includes all of their evergreen content geared towards beginners. This simple trick will exponentially increase traffic to all of your evergreen posts. If you do not have a designated section you risk your posts being hard to find as you continue to post newer content. Social media is a great place to distribute all types of content, especially evergreen content. Unfortunately, continually sharing evergreen content on social media can be time-consuming and downright hard to remember. Seriously, there is enough to try to remember on a daily basis. It is very easy to forget to share a piece of content you created two or three years ago. Tools like eClincher can make it easier for you to distribute your evergreen content by allowing you to schedule your post ahead of time. We produce a lot of evergreen content for this blog and unfortunately we were not getting the most out of our content because we were forgetting to share it as time went on. Certain that our customers were facing similar problems, we decided to create a solution. That solution is called ‘Auto Post’ and we are excited to share with you how it will ensure your evergreen content never goes to waste again. The best part? It will actually save you time compared to your current routine, even if you are only sharing it once now. The concept of Auto Post is simple: you upload your content to a queue (a list of posts) and fill out a one-time weekly schedule for that queue. Based on this schedule our tool will begin posting your content for you. When all of your posts have been published once, we will begin posting them again in the same order. Though Auto Post can be used for any type of content, it is exceptionally powerful for evergreen content since it will be continually shared automatically. When you complete a new piece of content all you have to do is add it to your existing queue(s) and it too will begin posting automatically. For more information on Auto Post, click here. Now that you know what evergreen content is and why it is important for your business, it is time for you to start producing it. Remember, you possess far more knowledge about your industry than the average person, so be confident sharing your expertise. By writing about “beginner” topics, you will also be able to put yourself in potential customers’ shoes. Consider your journey from beginner to expert and try to produce content to help turn your viewers into experts too. What tips or tricks do you use when producing evergreen content? Let us know in the comment section below! Want more content like this delivered directly to your inbox? Subscribe to our blog below.